The Pied Piper of Hamelin: A Medieval Mass Abduction? What really happened on June 26, 1284, in the German town of Hamelin? Over the centuries the legend of the Pied Piper has grown and has been recounted in countless books and movies. However, it is possible that this fanciful tale of a piper leading rats, then children, out of a town, may have been based on a real and shocking event. Here follows a marvellous wonder, which transpired in the town of Hamelin in the diocese of Minden, in the Year of Our Lord, 1284, on the Feast of Saints John and Paul. A certain young man thirty years of age, handsome and well-dressed, so that all who saw him admired him because of his appearance, crossed the bridges and entered the town by the West Gate. He then began to play all through the town a silver pipe of the most magnificent sort. All the children who heard his pipe, in the number of 130, followed him to the East Gate and out of the town to the so-called execution place or Calvary. There they proceeded to vanish, so that no trace of them could be found. The mothers of the children ran from town to town, but they found nothing. It is written: A voice was heard from on high, and a mother was bewailing her son. And as one counts the years according to the Year of Our Lord or according to the first, second or third year of an anniversary, so do the people in Hamelin reckon the years after the departure and disappearance of their children. This report I found in an old book. And the mother of the deacon Johann von Lude saw the children depart. There is also a mountain which lies approximately a rifle shot away from this town, called Calvary, and the townspeople say that in 1283 a man was seen possibly a musician, wearing clothing of many colors and possessing a pipe, which he played in the town. Whereupon the children in the town ran out as far as the mountain, and there they all disappeared into it. Only two children returned home, and they were naked; one was blind and the other mute. But when the women began to look for their children, the man said to them that he would come again in 300 years and take more children. 130 children had been lost and the people of this place were afraid that the same man would come again in 1583. Since I am again returning to matters concerning rats, I cannot neglect to mention a miracle of God, which in identical form was reported many years ago in the town of Hamelin in Westphalia concerning the banishment of rats; which story, because of its unusual nature, is definitely worth remembering, and there to conclude, that the Almighty created some odd creatures, without instilling in them human reason. Several hundred years ago the inhabitants of the town of Hamelin in Westphalia were plagued with such a large quantity of rats, that it became unbearable. It so happened that a foreigner, an unknown or traveller, much as the travelling students of long ago, came into town. Hearing the troubles and complaints of burghers, he proposed whether they would consider a reward for him if he were to remove the rats from the town. They were overjoyed with such news and for his offer they promised to pay him a sum of several hundred guilders. With that he went through the town with a little pipe, which he then placed to his mouth and commenced to play. Immediately all the rats in the town came running out of the houses and in unbelievable numbers began to follow his feet as he walked out of the town. He banished them to the nearest mountain and no more rats were seen in the town. This accomplished, he demanded his promised reward. But they had hidden it away, confessing that although they had been in agreement with the sum, that since the matter had caused him no difficulty, but rather he had dispensed with his task so easily, not by hard work, but by an unusual art; therefore, they felt that he should not ask for so much, but lower his sights and take less. The stranger, however, insisted on keeping the original agreement and he persisted in seeking the sum promised him, and if they didn’t give it to him they would rue it. The townspeople, however, stayed with the opinion that this was far too much money, and they no longer wished to give it to him. When he realize that he was not going to receive anything, the stranger began to walk through the streets with his pipe as before. There the majority of the children in the town under the age congregated, and they followed at his feet and out of the town to the nearest mountain. The mountain miraculously opened up and the stranger and the children went inside. Immediately afterwards it closed up again and neither stranger nor children were ever seen again. Now there was great wailing throughout the town and the people could do nothing but commit themselves to God and admit their guilt. The town reported this wondrous story in all its correspondence as an eternal reminder and added the right number on the date according to the birth of Christ; on the end, however, they added to the departure of the children in such and such a year. In The Pied Piper: A Handbook, Wolfgang Mieder provides translations of the various historical accounts of the Pied Piper story, as well as looks at the explanations given to what might have actually happened. Some theories suggest that these children had taken part in the Children’s Crusade or were victims of the Black Death. Some historians believe the story might have originated with young men from Hamelin who were killed at the Battle of Sedemunder in 1259. A more recent theory proposes that these were young people (not necessarily children) who were recruited to move east to Transylvania – in the second half of the thirteenth century many Germans were being persuaded to settle in these new communities. 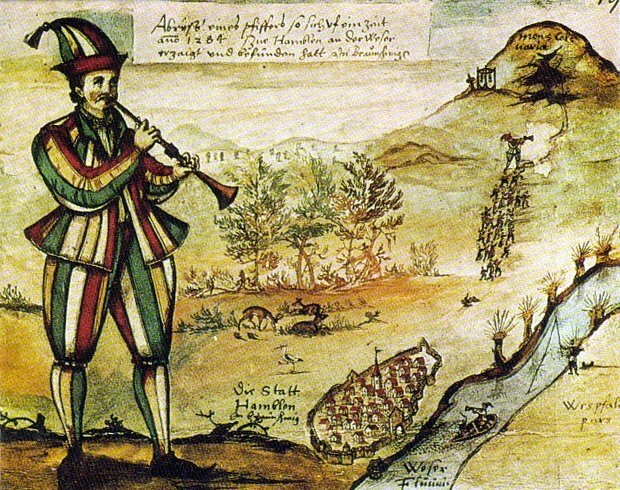 We will probably never know how the story of the Pied Piper of Hamelin first came about. One should consider that part of the story might be true – that in 1284 some, perhaps many, of the town’s children disappeared. Could a group of criminals lured them out of the city and abducted them? If so, it would have been an event that scarred the people of Hamelin for generations, and whose notoriety would have spread throughout Germany and beyond for centuries afterwards.